As originally posted by By Melissa Simon of the Simi Valley Acorn. Rubble scattering the streets, the smell of fire in the air, and structures completely demolished might describe the aftermath of a war-torn country. But this wasn’t war and it wasn’t another country. These were the sights that greeted former Marines Colt Curtis, Adam Martinez and Roland Vandenberg; Army veteran Joe Trupiano; and friends Durell Fowlks and Christopher Swift on Sept. 12 when the six arrived in Woodsboro, Texas, a small town with about 1,500 people. Except for Vandenberg, who lives in Palmdale, the men are residents of Simi Valley. “It was absolutely devastating and reminded me a lot of being overseas. People have been without water, power and electricity and will be for quite some time,” said Curtis, owner of veteran-operated Attention to Detail Moving in Simi Valley and Camarillo. The trip to help Woodsboro came about when Curtis’ friend Martinez reached out to other veterans’ organizations to see how he could pitch in with relief efforts. The 36- year- old said he planned to take donations to Texas. Once the crew of six filled half of a 26-foot-long moving truck, which can hold up to 10,000 pounds of items, they headed to Woodsboro. For Swift, 35, the hardest part was coming home to hear people complain about a flat tire or their Starbucks order when residents of Woodsboro can’t get water, don’t have a roof over their heads and have been wearing the same clothes for weeks because it’s all they have. 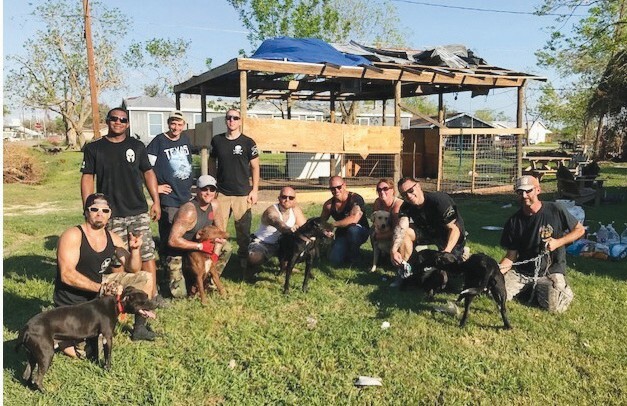 In addition to bringing donated clothes, cleaning supplies and other essentials, Trupiano, 34, said the team helped build a shelter for a dozen stray dogs, cut trees out of power lines and cleaned out homes. “Because of the flooding, there’s black mold in the walls that have to be bleached before people can move back into their homes, but there isn’t enough bleach, so these people will be temporarily displaced,” Trupiano said. Despite the help they gave, Curtis said, their job isn’t done yet. The men plan to head back to Woodsboro in the next month to deliver more clothing, cleaning supplies and other essentials. They’ll also be taking school supplies and backpacks donated by more than a dozen Simi Valley and Ventura County schools. “Our goal is to take two full trucks with us this next time because we want to be able to help them as much as possible, and that amount of stuff can change their lives for a couple of months,” Curtis said. As the father of two daughters, Fowlks said, seeing the children displaced by the hurricane motivated him to donate his time to rebuilding Woodsboro. For more information about making a donation, visit Attention to Detail Moving’s Facebook page or call (844) 668-3223. Donated items can be dropped off at Joe Trupiano’s home at 3216 Yardley Place, Simi Valley; Adam Martinez’s office at 340 N. Westlake Blvd., #150, Westlake Village; or Attention to Detail Moving at 1151 Avenida Acaso, Camarillo.